Most rings found in nature are part of a larger structure, so understanding the shape of the ring is just the beginning of the question of conformation. How will substituents that are attached to the ring affect the shape? Let's look at substituted cyclohexanes, because they are very common and because their flexibility allows them to adopt very different shapes in order to accommodate attached groups. Replacing one of these hydrogens with a methyl group would result in the methyl group sitting in either an axial or equatorial position. Let's assume it's in an axial position, which is above or below the ring rather than out to the sides. We know that there is no torsional strain in the chair, and we'll assume that the methyl group can be oriented such that it has no torsional strain either. We do need to look for steric strains. You will find that the methyl hydrogens are close to the two axial hydrogens on the same face of the ring. This is a six atom interaction in each case. We will assume that the methyl group is rotating freely such that only one of its hydrogens is close enough to these axial neighbours to cause steric strain, but there will be strain with both of those axial hydrogens. 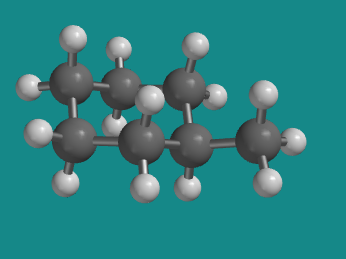 Sighting along the CH2--C(H)Me bond on the edge of the ring, you can see that the interaction between the axial methyl and an axial hydrogen resembles the gauche interaction in butane. These two steric interactions will cause an increase in strain energy of about 2 kcal/mol . Figure CA9.1. Methylcyclohexane in an axial methyl conformation. This chair conformation is undoubtedly somewhat stable; there is much less strain in this compound, for instance, than there was in the boat conformation of cyclohexane. However, it's possible that there is an even more stable conformation, and if so we should be able to find that conformation by twisting around some of the bonds in the molecule. In cyclohexanes, there are usually two different chair conformations that can be accessed via a "ring flip". To see this, grasp a model of methylcyclohexane and identify two corners at opposite ends of the hexagon (the first and fourth carbons in the ring). One of these corners will be pointing down; push it up. The other corner will be pointing up; push it down. In doing so, all the other corners of the ring will change positions from down to up and from up to down as well, so that you end up with a new chair. If you carry out a ring flip on methylcyclohexane, you will find that the methyl group moves between an axial position and an equatorial one depending on which form of the chair conformation it begins in. The actual compound can do this pretty easily at room temperature; although these two chairs occupy energy minima, the energy barrier between them is pretty low. It's possible that one of these conformations is a global minimum, however. Take a look at the new conformation of methylcyclohexane, with the methyl group in an equatorial position. There need be no torsional strains. The methyl group is not very close to any neighbouring hydrogens. It is 5 atoms away from a couple of the other equatorial hydrogens, but 5 atom interactions are not large enough to worry about. As a result, there is no significant strain energy in this conformation. This is the most stable conformer of methylcyclohexane. Figure CA9.2. 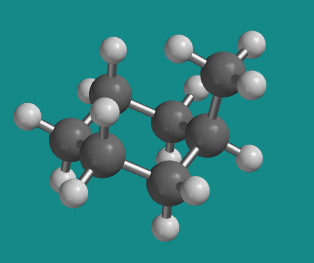 Methylcyclohexane in an equatorial methyl conformation. It is usually the case that when substituents are in equatorial positions, the conformation is more stable, for the same reasons that we saw with methylcyclohexane: it is pointing outward, away from the rest of the ring, rather than sharing the space above the ring with other atoms. However, it may not always be possible for substituents to be in that favoured position. Practice drawing these monosubstituted cyclohexane structures in the chair forms. a. Draw the compound on a diamond lattice. b. Draw the other chair conformation. d. Determine which conformer is more stable. Label the substituents as axial or equatorial and as up or down.